See the above video from the Johns Hopkins Bayview Aliki program to encourage excellence in the doctor-patient interview - focusing on the inpatient setting. 1. Are there ways in which good physicians can be poor communicators, or vice versa? 2. What are some experiences you have had with health care providers, and how have you matched their communication style with theirs? Additional resources: Time spent on the visit has a lot to do with how the doctors and patients get their work done, how the clinic is organized. There is currently a fair bit of work being done on clinic redesign. 1. Have you ever had a visit with a health care provider which was short, but seemed "longer," i.e. focused on your needs and concerns? 2. What is the best way to ensure that the doctor and patient spend enough time together: mandated visit times? required communication practices? criteria for health care outcomes that are "good"? Additional resources: Check out this article on the relationship between physician personality and doctor-patient communication. 1. What is most important to you in a health care provider? Who has been your "best" (or "worst") doctor, and why? Additional resources: When did doctors start thinking about professionalism? Emund Erde compares and contrasts the development of professionalism and ethics, arguing that the two conflict in basic ways. If you were to draw a figure, similar to those in Figure 4, about what elements of a doctor's professional identity - personality, characteristics - are most important, what would it look like? Additional resources: Recently, a group I headed up conducted a review of the scientific literature examining whether "public reporting" of quality information actually improves outcomes related to patients. The answers might be unexpected. How do you pick your health care providers? Do you make use of publicly available health care information? What matters most to you about a doctor - how would you tell someone else about how good a doctor is? After reading this chapter, are there health concerns that you might phrase differently, or shape a narrative around so that your provider understands your problem better? Additional resources: Here is a radio interview with one of the pioneers of mindfulness in the healthcare arena regarding the use of such techniques in the doctor's office. 1. Are there situations outside the visit with your health care provider where you have managed to exercise mindfulness? What advice do you have? 2. What if neither doctor nor patient are concentrating on the visit - how can you get back on track? 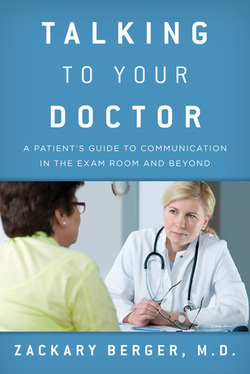 Do you feel empowered to communicate your needs to your doctor? What intimidates you the most? What give you confidence? What items do you feel go unaddressed from your agenda? What behaviors do you need to change? How can addressing motivation help? Are there bodily issues you would never tell your doctor about? Are there people you talk to about issues when you're not comfortable talking to them? 1. What is the relationship between your community, however you define it, and your health care providers? How might it be improved? 2. Do you agree, in your experience, that there is a connection between the relationship betwen you and your doctor and the health of your community? Additional resources: A paper for the Institute of Medicine by Rita Redberg at the University of California, San Francisco, details the history and goals of the "Less is More" movement mentioned in the book. 1. What happens when you want a test or procedure which your doctor thinks is not a good idea? 2. Are there treatments which you think are underused in our current system? Additional resources: There are a number of organizations advocating for the central role of a relationship with a primary care provider. Two notable examples among them are the National Physicians Alliance, mentioned in the book, and Primary Care Progress. Recent literature also shows that the care of physicians and nurse practitioners is comparable for many commonly encountered conditions. Questions for discussion: How would you remake our system? How can we put communication with our primary care provider, and our relationship with them, at the center of our system - or is that the right way to rework it?